Our modular garages are portable and great for everyday use as a residential garage, or for compact tractors and recreational equipment. They also work great as a workshop or storage space for that antique car project. Use them for a backyard tinker shop, a man cave combination, or many other uses! We can also deliver 2-story garages with lofts and inside stairs, as well as totally custom built garages where you can specify custom shelving, work benches, or overhead storage. If you need something special to accommodate an unusually shaped space, or for an over-sized vehicle like a new RV garage, just give us a call for a custom quote that we think, “you’ll love”. 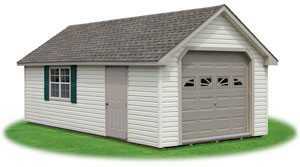 You may want to also see our modular steel garage sales page.